During the first few days of a post-exam relaxation phase, it’s obvious that binge watching becomes an irresistible choice of indulgence. So after getting tired of sleeping for hours, I decided to turn to my television’s aid as a cure to my remaining exam hangovers. As I lay curled up in bed, flipping from one channel to another to find the most perfect show in a maze of television series, I immediately stopped at a place which relaxed the motion of my hand instantly. Despite watching each episode more than a hundred times and owning a set of all its seasons to increase the numbers even more, I still knew I’d be unable to find any show better than FRIENDS to give me the solace I needed. That’s when I was drawn to a realization that despite being addicted to numerous shows throughout my teenage years, I always found myself coming back to those few all-time favorite classic American series which not only possess a power to cheer us up within seconds, even today, but also make us relive a bundle of golden memories that we hardly get time to remember and cherish in our busy lives. So while some are still being aired in India (luckily), and some aren’t (unfortunately), here is a list of the TOP FIVE American Television Sitcoms of 1990s that we never seem to get enough of – and neither do we ever hope to! With more than twenty years of its release, it remains till date, undoubtedly, the most loved and sought-after show ever produced in the history of television. Centered on the lives of six friends in Manhattan and their impetuous ups and downs, this show makes one generation after another laugh uninhibitedly and teaches the older ones that some addictions (or almost all jokes of this show) never get old. From Ross’s professed love for dinosaurs and Phoebe’s unique ice-breaking song collections to Monica’s neurotic enthusiasm and Chandler’s biting sarcasm, there was something hilariously charming in each one that glued us to them forever. Whether it’s Joey’s “How you doin’?” to his utter refusal for sharing of food or Ross and Rachel’s “We were on a BREAK” fiasco to Phoebe’s signature composition- Smelly Cat, there’s always something one can easily find to smile or laugh about in all its episodes which almost make us oblivious to our problems in life, as long as we’re in their presence. As time passes by, these six friends in ten seasons of happiness are bound to “Be there for you” for life. There is something magical about this very name which brings a wide smile across anyone’s face who has ever been lucky enough to watch it. Contrary to the popular belief, this American family revolutionized the family culture in the most real and sweetest way possible. The awesome trio of Danny Tanner, the Father (the sensible one), Uncle Jesse, his brother-in-law (the handsome one) and Uncle Joey, his best friend (the dorky one) showed how raising three little girls- DJ (the tomboy one), Stephanie (the mischievous one) and Michelle (the coolest one) under one roof was no piece of cake, and yet, in their most cracking sense of humor handled every single dilemma from their very first steps, school days to boyfriend dramas in an unbelievably adorable way. Apart from Jesse’s ‘Elvis’-ness and Joey’s goofiness, what made this show even better were the comical ways in which the sisters never left a single chance to mess with each other. DJ and Stephanie’s arguments on the most random issues being complimented with baby Michelle’s priceless reactions were served like an icing on top of the cake. Michelle Tanner, the youngest, funniest and cutest of the three siblings in Full House. Set in the spirit of 1970s- the decade of love and rock ‘n’ roll, this is one show that dials up every possible level of craziness and gets you fixated on the most ridiculously flawed group of teenagers after only one episode. The major plot revolves around Eric Forman, a typical geek with a forever-confused look, born to Red and Kitty Forman, a father who lived for the joy of his son’s embarrassment and a vivaciously cool mother whose wittiness was incomparable to that of any teenager. With Eric’s consistent chaos with his sensible girlfriend, Donna and the pretty rich brat, Jackie’s clash of views with her incredibly dim-witted boyfriend, Kelso, were the two relationships which formed the foundation of a never-ending amusement. Fez, a young ambiguous foreigner and Hyde, the indifferent sarcastic king of the group further completes their entire entertainment package with a kick. The influence of the gang remains as strong as it ever was as I still find myself grooving to their title song, nodding my head along with them and singing its lyrics; and finding a comfort like no other. ‘Cheap Trick In The Street’- the theme song of That 70’s Show. Caution: Highly Addictive. Listen at your own risk. All those who’re aware of this show know exactly just how amazing it is to reminisce some of its best moments with another Seinfeld fan/s, especially since one gets to live such moments quite rarely. Being aired only for a brief period of time in India and then rerun with a couple of episodes few years back was not enough to do the show justice. While the trend of the 80’s fashion or payphones may have been outdated, the jokes certainly haven’t. Seinfield’s Jerry, Elaine, George and Kramer- the coolest group of friends television has ever witnessed. The very fact that a show of the 90s has been able to garner such an endless amount of love and appreciation that its story continues till date, reaching a peak of 27 seasons is more than enough to mark its appeal in the world. Set in the town of Springfield, the Simpsons are an exceptional, one-of-a-kind family that every child wished to be a part of. The humorous affairs mostly concentrate on the lives of Homer Simpson’s atypical anti-father/husband figure running on the ambition of unproductive-ness, endless donuts and laziness, his wife Marge, an ideal housewife and a caring mother who tries her best to keep her family as remotely sane as possible with their three kids- Bart, the impulsive troublemaker, Lisa, the vegan, smarty-pants and Maggie, an infant of the family. Over the years, after having witnessed a plethora of animated shows, it has been proved that none of them have been able to come anywhere close to this pure comedic brilliance of animation and achieve the replacement of a family as dysfunctional and idyllic as the Simpsons. 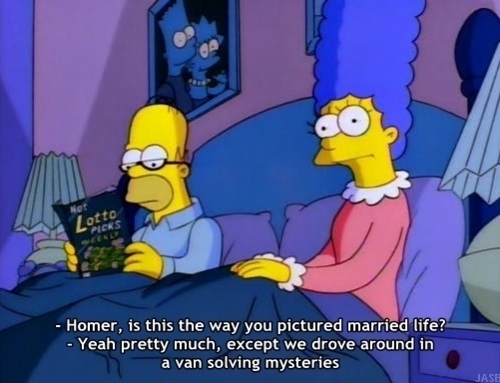 Homer and his wife, Marge Simpson- the most EPIC couple of the animated world of television. I sometimes wonder how life would have been had these shows never been produced. Well, certainly not the greatest one, that’s for sure. If only I could go back in time and watch each one of them all over again, for the very first time, I would. So while these sitcoms continue to remain close to my heart, I’d suggest those who have never watched some of them (or any, God Forbid!) to take out some time in these holidays and experience the nostalgia of 1990s along with happiness and laughter on a whole new dimension.